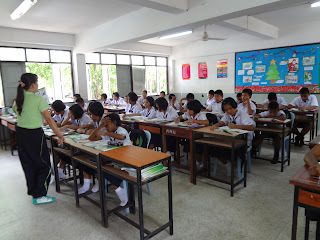 Teaching the local children in Surin English is not longer done by us. Because yesterday, we finished our last lessons in our school. It was a day to remember. But before I talk about that, I would like to give you an insight in the different costumes and uniforms the teachers and pupils wear during a normal school week. On Mondays, each teacher wears a uniform fashioned by the Thai government. It’s a beige outfit and they look like military uniforms. On Tuesday, every teacher wears a pair of sweatpants and a green polo shirt emblazoned with the school logo. On Wednesdays, its boy- and girl scouts day. And not only do the pupils wear a uniform; the teachers wear it as well. I got to say, seeing a grown man in a costume meant for children and young adults is quite hilarious. 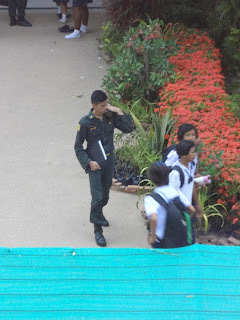 On Thursdays the teachers are free to wear whatever they want (and this is the only day mind you) but some pupils wear a dark green military uniform. If they wear this every Thursday for three years they can skip their military duty. And on Fridays every teacher wears a blue/green shirt with the school logo on it, also known by two foreigners as: crazy Friday. Oh, by the way, the hat in the following picture isn’t required but it does make one hell of a nice picture, doesn’t it? During this week nothing really interesting happened apart from the fact that I joined the English Club on Thursday. The goal of this club is to ‘Edutain’. We tried to achieve this goal by singing and dancing the ‘Hokey Pokey’ song and playing a couple of games of Hangmen afterwards. The pupils seemed to love it, so of course, I was happy too. 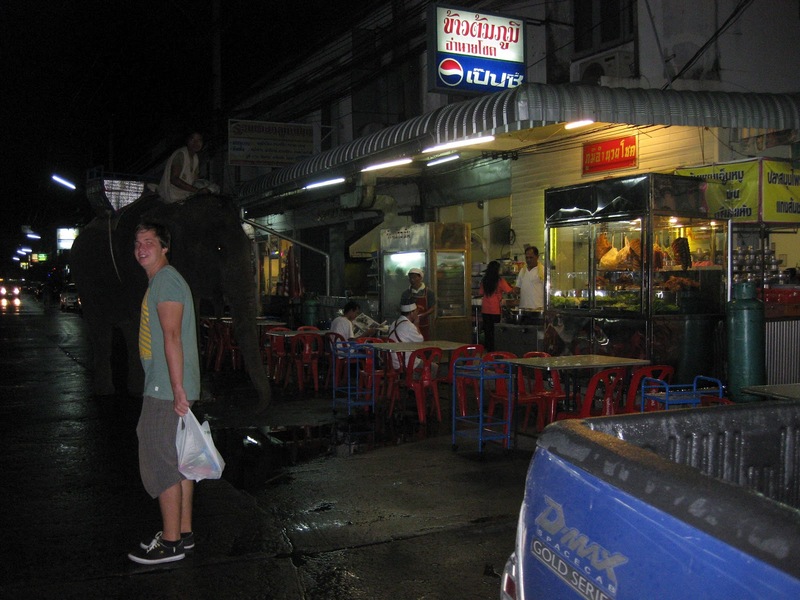 During the weekend we went to Surin for the very last time. We met up with Sally to get some school work done and we decided to pay one last visit to our favourite shops and bars. After a nice stroll to the city we went for a swim in our hotel and grabbed lunch afterwards. We were back home at around 14.30 on Sunday and we got some more school work done. Instead of decreasing this work seems to pile up so we got going and didn’t stop until dinner. On Monday morning Nele and I had a strange feeling; it was to be our last full week in Thailand and this was just strange. Time flew when we were here and we couldn’t believe it was our last week. 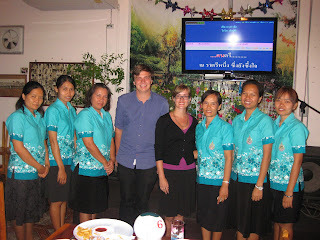 We got dressed, took our cameras and were off to teach some English. During this last week we also said goodbye to all of our classes. 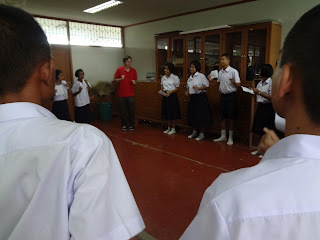 Some pupils were happy because know they didn’t have to speak English anymore but most pupils were genuinely sorry to see us leave the classroom for the last time. And now we’re at Friday the 1st of June. Our last school day and a day full of things that will be hard to forget. 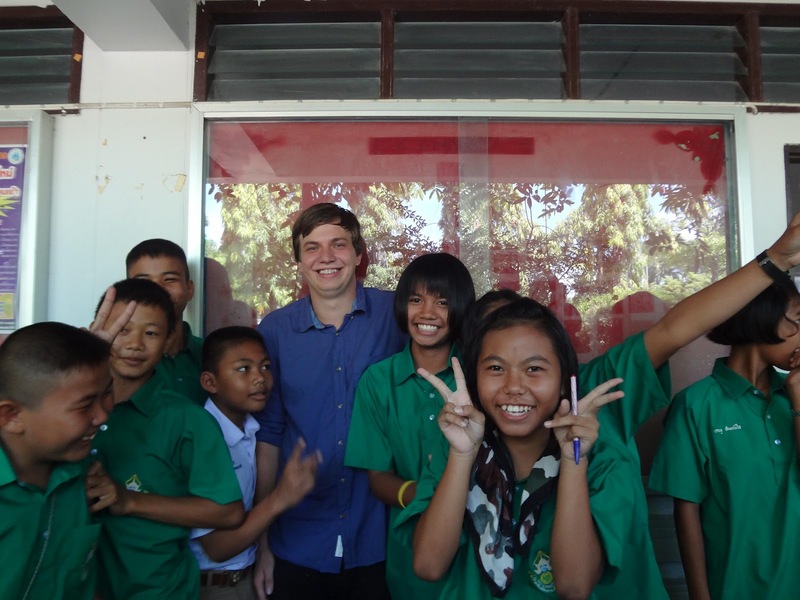 First off, we had a give a goodbye speech to 1700 pupils and about 100 teachers. Stage fever? Bad luck… With the money we received for guiding the project at the university we decided to buy English reading books to put in the school library. We gave these to the principal during the official morning ceremony just after our speech. To be honest it was hard saying goodbye to all those smiling faces shielding their faces from the morning sun. In the course of the day rain started pouring down; a sign that even the weather gods didn’t want us to leave their country? Anyway, we said our last goodbyes to our ‘favourite’ pupils and we headed to the teachers’ lounge. 30 minutes later we were headed to the Lamduan Karaoke Bar for a night of sheer fun and delicious food. 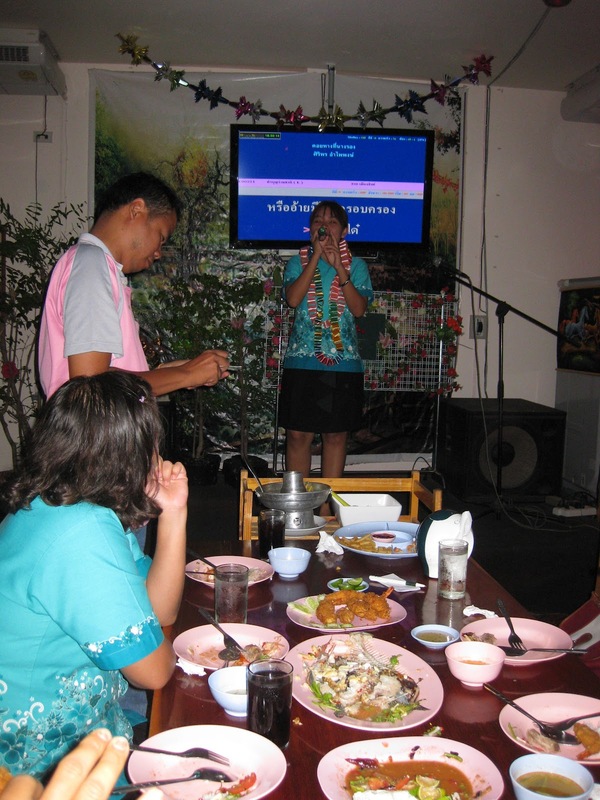 We had heard from several reliable sources that Thai people loved singing karaoke and indeed, they do. We entered a strange looking room (to be honest, it reminded me of a football cafeteria) and sat down with the principal and vice principal. In the end, about 10 teachers joined us that night and we had a lovely time. We ate some yummy fish, spicy soup and French fries as appetizers. 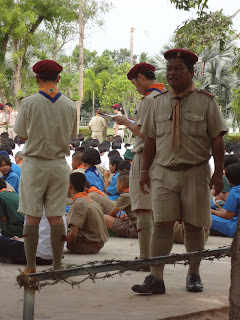 One thing we noticed, every Thai sings as if their lives depend on it. They make funny faces, go on stage and when they do they receive tips from their colleagues. We laughed a lot and time passed quickly. Before we said our goodbyes, every teacher wanted their picture taken with us and we gladly obliged.